Confederacy, Confederate States of America, Adjutant and Inspector General's Office, semi-official imprint on legals-size cover bearing 5¢ olive green, Stone A/B (1c) horizontal pair with large margins, tied by "Richmond Va., Nov 6, 1861" cds to the Governor of Tennessee at Nashville, endorsed "Chge H.G.O." at bottom left; minor cover restoration, Very Fine appearance with a choice pair. C.S.A. Catalog No. WG-AG-09 Estimate $400 - 600. 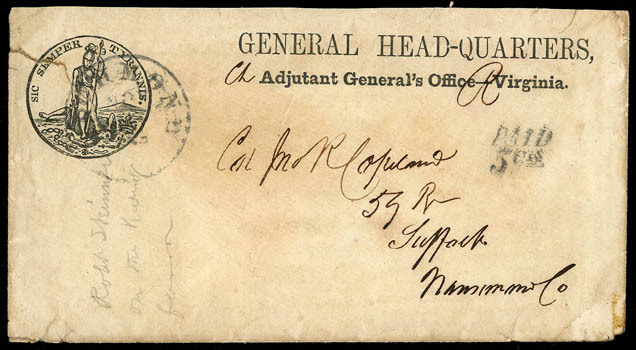 Confederacy, General Head-Quarters Adjutant General's Office-Virginia, imprint and state seal on cover with "Richmond, Va., Nov. 20 1861" cds with matching "Paid 5 Cts" handstamp, addressed to "Col. No R. Copeland, 59 R(egt) Suffolk, Nansemond Co" (now Suffolk County), with pencil docketing "Robert Skinner on the Keeling favor", manuscript "Ch" (charge) and "R" which seem to indicate the indistinct postmark as November 20, 1861 as Postmaster Steger eliminated charge accounts upon taking office in September 1862 from Postmaster Bigger; top back flap missing, sealed tear at left into state seal and small tear at top right not into imprint, Fine, ex-Lemley. C.S.A. Catalog No. S-VA-12 Estimate $300 - 400. The 59th Virginia Volunteers were under General Wise. After the war, Copeland was President of the Farmer's Bank of Suffolk. 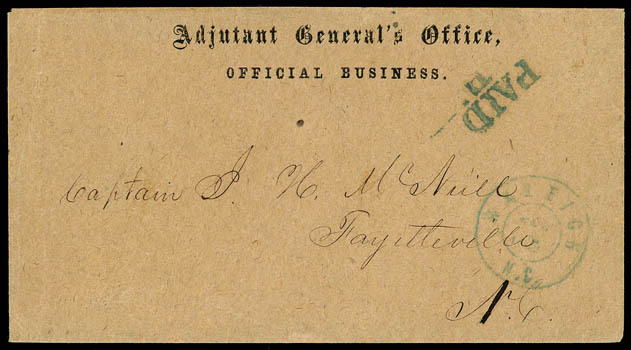 Confederacy, Adjutant General's Office, semi-official imprint on brown cover with blue "Raleigh N.C., Jun 15" double-circle datestamp and matching bold "Paid" handstamp to Capt. J.H. 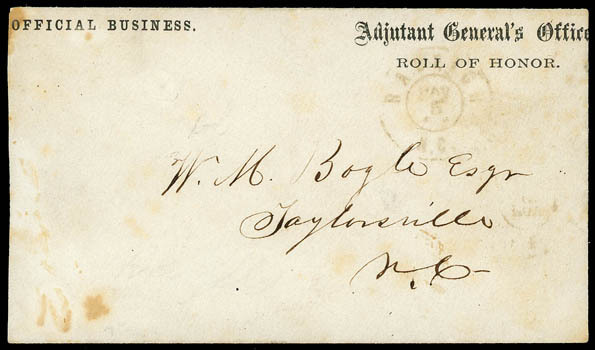 McNeill at Fayettesville N.C., Extremely Fine, ex-Milgram (backstamp). C.S.A. Catalog No. WG-AG-02 $400. 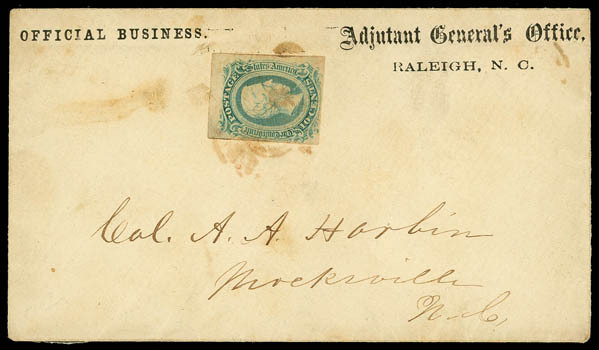 Confederacy, Adjutant General's Office, Raleigh, N.C., semi-official imprint on blue cover bearing 10¢ blue (11), large margins to just touched at left, tied by blue grid cancel, matching "Raleigh N.C." cds to Mocksville N.C.; reduced slightly at left, Very Fine, This is the CSA listing example..
C.S.A. Catalog No. S-NC-15 $400. 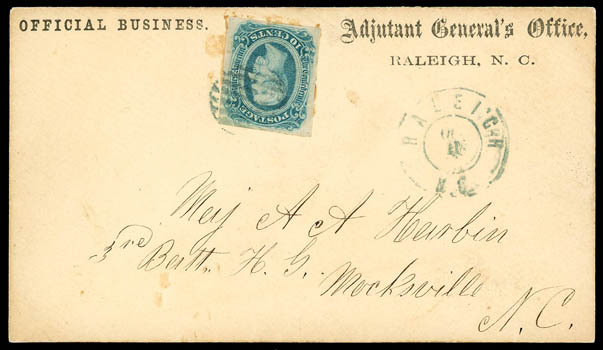 Confederacy, Adjutant General's Office, Raleigh, N.C., semi-official imprint on cover bearing 10¢ blue (12), large margins, tied by blue grid cancel, matching "Raleigh, N.C., Oct 10" double-circle datestamp to Major A.A. Hurbin, 3rd Batt. H.G., Mocksville N.C., Very Fine, This is the CSA listing example..
C.S.A. Catalog No. S-NC-09 $400. 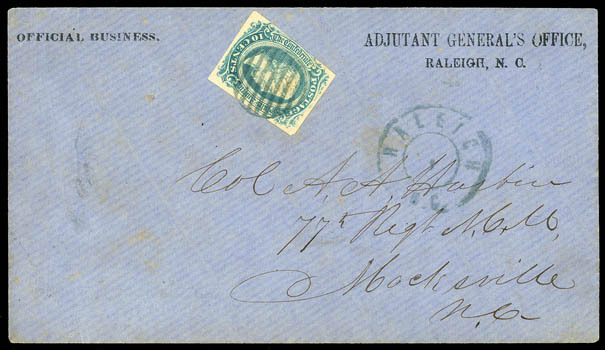 Confederacy, Adjutant General's Office, Raleigh, N.C., semi-official imprint on cover bearing 10¢ blue, short transfer at top (11 var. ), tied by red Raleigh N.C. cds to Col. A.A. Horbin, Mocksville N.C.
C.S.A. Catalog No. S-NC-10; $400 Estimate $200 - 300. Confederacy, Adjutant General's Office, Roll of Honor, semi-official imprint on cover bearing on reverse 10¢ blue (11), large margins, tied by red Raleigh N.C. cds, matching May 5th strike on face to Taylorsville N.C.; reduced slightly at left, Very Fine and rare imprint. C.S.A. Catalog No. WD-AG-10 $750. 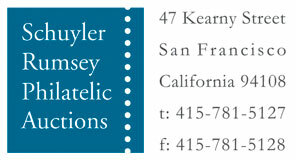 Confederacy, C.S. 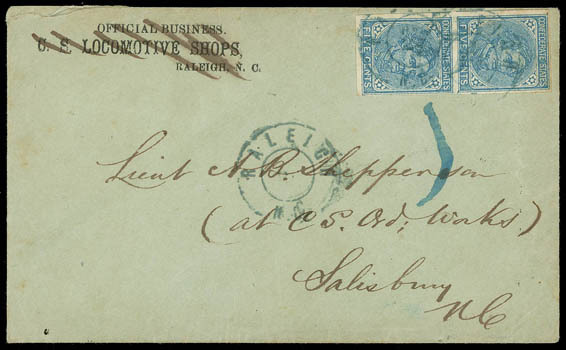 Locomotive Shops, Raleigh, N.C., semi-official imprint crossed out in manuscript as usual, on green cover bearing 5¢ blue (7) vertical pair, tied by two strikes of blue "Raleigh N.C." double-circle postmark, additional strike adjacent to Lieut. A.B. Shepperson (at C.S. Ord. Works), Salisbury N.C., original letter datelined "Raleigh Mch 23. 1863", Very Fine. C.S.A. Catalog No. WD-QM-34 $750. 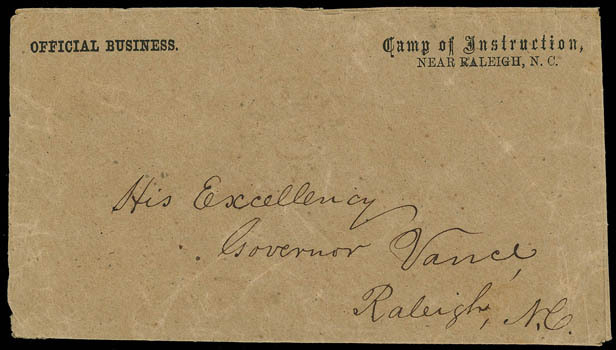 Confederacy, Camp of Instruction, Near Raleigh, N.C., semi-official imprint with light strike of N.C. town cds on cover addressed to His Excellency, Governor Vance, Raleigh N.C., Very Fine and unlisted. C.S.A. Catalog No. WD-unlisted Estimate $300 - 400. 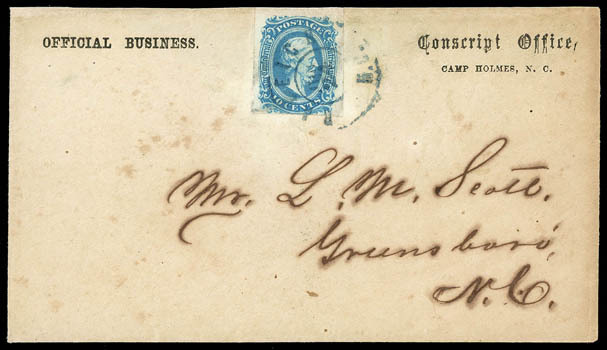 Confederacy, Conscript Office, Camp Holmes, N.C., semi-official imprint on cover bearing 10¢ blue (11), large margins to touched at bottom, beautiful intense shade, tied by "Raleigh N.C., Jun 24" double-circle datestamp to Greensboro N.C.; no back flap, Very Fine, This is the CSA catalog listing example. C.S.A. Catalog No. WD-CN-04 $500.